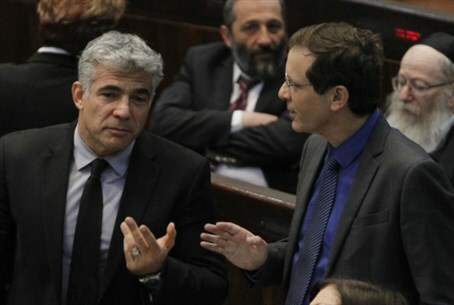 Yesh Atid chairman assures Labor chairman he will not try to lead the opposition despite being the largest party in it. Yesh Atid chairman Yair Lapid on Tuesday evening spoke with opposition leader MK Yitzhak Herzog (Labor) and assured him that he will not try to assume his position, now that he and the rest of his ministers have left the government. Lapid’s decision not to ask to head the opposition comes despite the fact that his party, with 19 seats, will be the largest party in the opposition, ahead of Labor which has 15 seats. Earlier Tuesday, Prime Minister Binyamin Netanyahu fired Lapid as well as Justice Minister Tzipi Livni (Hatnua), effectively disbanding the government. Several hours later, all Yesh Atid ministers responded to Netanyahu’s move and quit their posts in protest of the dismissal of Lapid. Approximately two hours after he fired Lapid and Livni, Netanyahu held a press conference in which he officially launched his election campaign, telling voters who wanted a strong government to vote Likud, noting that the formation of the government was determined "because the party under my leadership, the Likud, didn't get enough mandates...so there were in the government contrasting angles." He blasted Lapid and Livni of trying to organize a “putsch” against him, and called on the public to vote for Likud to give him a true mandate to lead the nation. Following Netanyahu’s press conference, Knesset Speaker MK Yuli Edelstein (Likud) summoned all Knesset party heads to his office on Wednesday morning at 10:00 a.m. to set the date for snap elections.